Most of the evidence from studies analysing the effect of ethnic concentration on immigrants’ employment and earnings points to a positive effect of network size on labour market outcomes. This column uses data from social security records in Germany to show that a larger co-ethnic network in the location of first settlement can increase the short-run probability of finding a job but can also hinder human capital investment, limiting the benefits of the larger network over the long run. The recent wave of asylum seekers from North Africa and the Middle East to Europe, which peaked in 2015-16, sparked the debate on many issues related to migration and its impacts, including its economic costs and contributions. Which factors contribute or hinder the economic and social integration of immigrants into host countries? Typically, economic immigrants tend to locate in areas where other previous immigrants from the same country already reside (as shown in a large body of literature such as Cutler and Glaeser 1997, Borjas 1998, Bertrand et al. 2000, Cutler et al. 2008). Potential reasons for this choice include information on job opportunities and mutual support. Refugees, however, are often resettled through policies that imply a broader dispersal (relative to what they would have likely chosen). The goal of these policies is to distribute the initial burden and adjustment costs for local communities. Understanding the implications of ethnic concentration on the economic success of immigrants is important for host countries to evaluate the rationale and consequences of these resettlement policies. The economic literature has extensively analysed the effect of ethnic concentration and social networks on labour market outcomes of immigrants. Important theoretical contributions to the modelling of social networks and their effects on labour market outcomes build on Calvó-Armengol and Jackson (2004), where social networks are a source of job information and therefore improve job opportunities. Several empirical studies find positive effects of the size of social networks on earnings (Edin et al. 2003, Damm 2009) or employment (Munshi 2003). Two mechanisms might be at play behind the effect of social networks: information transmission and competition (Beaman 2012). As Beaman (2012) discusses, networks can be beneficial for employment opportunities when their members are well established, but can be detrimental for newcomers if many network members are looking for a job at the same time. In addition, while larger networks of co-nationals may help in finding a job quickly, they could potentially lower the incentives to invest in human capital. Despite the broad evidence on labour market outcomes, no studies have looked at the potential effect of social networks on human capital accumulation of immigrants. We contribute to this literature by analysing the trade-off that co-ethnic networks produce between providing employment opportunities that result in higher probability of employment in the first years after arrival and reducing the incentives to invest in human capital (schooling, training) (Battisti et al. 2018). Jobs found through social networks may be quickly available but, especially for less-skilled individuals, may not lead to the skill accumulation that is beneficial to them in the long run. Using a simple search model, we show that if a larger co-ethnic network raises the frequency of job offers, this will increase the probability of employment but it will also lower the incentives to invest in human capital. These effects are concentrated in the few years after migration and are stronger for less-skilled individuals, for whom informal job search is more important. Our empirical analysis is based on a recent survey of immigrants in Germany matched to administrative records. We observe the entire labour market history of each individual coupled with a rich set of characteristics, including pre-migration variables. We construct a precise measure of co-ethnic network, based on country-specific employment shares in each district. The fact that immigrants may sort themselves into specific networks means that it is difficult to establish a causal relationship between network size and employment or human capital. If, for example, cities with large networks attract immigrants with lower skill levels, less motivation, or different pre-migration experience, the correlation between network and outcomes can be spurious. First, we can include a rich set of pre-migration controls (employment, education, language) usually unobserved in administrative datasets and hence substantially reduce the risk of omitted variable bias. Second, we can include a rich set of fixed effects proxying for observables and unobservable city-specific, ethnicity-specific, and time-specific economic and demographic characteristics. Finally, we can restrict our analysis to a subsample of refugees and ethnic Germans, whose initial location was decided by a central authority. Because of the allocation mechanism, the estimates of a network effect for this group should be close to causal. Our empirical analysis shows that finding a job through social contacts (as opposed to online or through official channels) is the most common job search method among immigrants: 60% of immigrants in our sample (65% among those with less than post-secondary education) found their first job in Germany through social contacts. We then show that a larger network in the district of arrival raises the probability of finding the first job through social contacts and reduces the likelihood of finding the first job through internet or newspapers. Our main findings show that a larger co-ethnic network in the district of first settlement increases the probability of finding a job in the first two years after arrival. It also decreases the probability of investing in human capital. 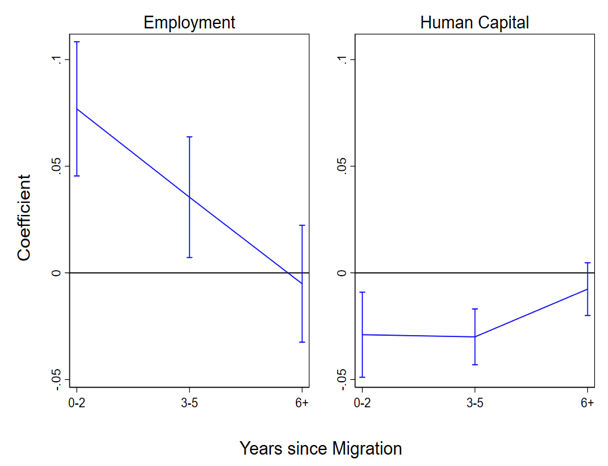 Figure 1 reports the magnitude of these effects (and the 95% confidence intervals) by years since migration – the left-hand panel reports the employment effect, and the right-hand panel the human capital effect. The effects are concentrated in the early years: employment probability is seven percentage points higher in the first two years after migration for a one standard deviation increase in the size of the co-ethnic network. On the other hand, human capital investment decreases by around three percentage points for a one standard deviation increase in the size of the co-ethnic network. Once we look at different types of human capital investment, we find that the strongest and more persistent effect occurs for schooling and university as opposed to vocational training. The negative effect of co-ethnic network on the probability of investing in school-university persists after five years. Note: The graph reports the coefficients from linear probability regressions on a representative sample of recent immigrants to Germany. Our dependent variables are dummies for employment (left Panel) and human capital (right Panel). Each point corresponds to the effect of an increase in our measure of network size by one standard deviation. The vertical spikes correspond to the 95 % Confidence Intervals. The results mentioned above are obtained from a regression that includes a rich set of fixed effects and pre-migration controls. Once we condition on those controls, the estimated coefficient is quite stable. It is also robust to restricting the analysis to a sample of resettled refugees and ethnic Germans, for which the sorting should not be a concern. Our findings are consistent with a causal nexus from network to employment and human capital accumulation of immigrants. Finally, consistent with the idea that individuals with lower levels of education are those relying more heavily on social contacts in order to find a job, and those probably helped most by a marginal increase in human capital, we find that both effects on employment and human capital are stronger and more significant for this group. Previous studies have looked at the labour market effects of co-ethnic networks on immigrants without considering the dynamic dimension and the potential effects on human capital investment decisions. Our analysis begins to fill this gap. The results point to network effects during the first five years after migration. We show that network effects can be beneficial in terms of employment opportunities, but larger networks can also reduce the investment in human capital of newly arrived immigrants. More human capital often implies better language skills and more knowledge of the host country, with potentially positive effects on future labour market outcomes. Hence, the short-run beneficial effect of networks do not persist in the long run and may be offset by lower human capital accumulation. These findings suggest that settlement policies aimed at dispersing refugees across locations, may hurt them less than has been implied by earlier studies, and may encourage higher investment in human capital. Battisti, M, G Peri and A Romiti (2018), “Dynamic Effects of Co-Ethnic Networks on Immigrants' Economic Success”, NBER Working Paper 22389. Bertrand, M, F P Erzo and S M Luttmer (2000), “Network Effects and Welfare Cultures”, The Quarterly Journal of Economics 115(3): 1019–1055. Borjas, G J (1998), “To Ghetto or Not to Ghetto: Ethnicity and Residential Segregation”, Journal of Urban Economics 44(2): 228-253. Calvó-Armengol, A, M O Jackson (2004), “The Effects of Social Networks on Employment and Inequality”, American Economic Review 94(3): 426-454. Cutler, D M and E L Glaeser (1997), “Are Ghettos Good or Bad?”, The Quarterly Journal of Economics 112(3): 827-872. Cutler, D M, E L Glaeser, J L Vigdor (2008), “Is the Melting Pot Still Hot? Explaining the Resurgence of Immigrant Segregation”, The Review of Economics and Statistics 90(3): 478-497. Munshi, K (2003), “Networks in the Modern Economy: Mexican Migrants in the U. S. Labor Market”, The Quarterly Journal of Economics 118(2): 549-599.